Last night was great. I found a massage parlour and had a Chinese style massage for 80RMB for 50 minutes (quite expensive IMO). This blind (really she was blind) girl was chatting to me in English and she has such a cute oriental accent that sounded like honey to my ears (or what’s that expression)? The massage itself wasn’t too amazing. I kind of rate a massage by how much pain you put me in. I prefer Thai style, not so much for the pain, but by how the body is leveraged. Then I quickly got ready for the “Freedom celebrations” to discover my 100% cotton shirt to be horribly creased. Eventually I found a laundry shop that ironed it really well for 2 Juan. Traffic to the function at the “China World Hotel” was horrendous. At times my taxi didn’t move for 5 minutes. Some of the bus stops I saw on the way were quite amazing. A sea of people. At last I’m seeing examples of a large population. The function was huge. Much bigger than I was expecting. Usual crap with a completely generic “Freedom day” speech from the charmless ambassador. There were some south African dancers who put on a raw performance. 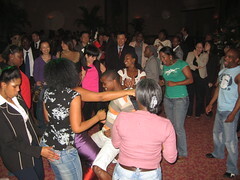 Comparing the sophisticated Beijing Opera and our lively African dancers gyrating their bits. Different worlds. I couldn’t help feel a little misrepresented as a white south African. I did try talk to several people who I thought looked a little South African. One turned out to be Bangladeshi and another Armenian. I’m losing my touch. 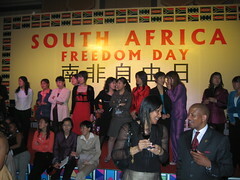 But they and Chinese in general were surprised I (white guy) am from South African. Another somewhat interesting thing is that South Africa isn’t the only embassy to have a military attache. I saw glorious military uniforms from several countries on display. Sadly I didn’t find the South African military official to abuse. There is this strange “name card” game being played here in Beijing, especially by young ambitious girls. I heard the most corniest lines in my life. “Haven’t we met before?” “I’ve heard your voice somewhere…”, then the please may I have your name card! Of course, I didn’t say no. I did manage to track down some of my kindred, who turned out to be language teachers in Beijing. There were really just 5 of us. 10 if you count the older business people. The wine flowed, though the food wasn’t that great, so I guess I drunk too much. We ended up going to another bar in Sanlitun (new embassy area) and I won’t put you through the details. I eventually got out of bed at 12 to organise a trip to the Great wall. Tomorrow is the start of the Chinese holidays so it is going to be a real arse fight I reckon. So what have I done today? Nothing. I did mean to fly a kite or visit a park. But the kite that I could have flown looked really crap compared to some others I’ve seen. For lunch I ordered sweet and sour chicken and end up getting these grease balls of an unidentifiable substance covered in a very heavy generic sweet and sour sauce. 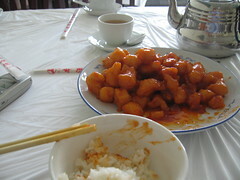 Last couple of Chinese meals have really sucked! Beer is quite alright and stupidly cheap here. I’ve probably mentioned this umpteen times already. 3Juan (0.30 EUR) for 630ml of ice cold beer from the Hostel bar. That’s a worthwhile reason for visiting this country alone! 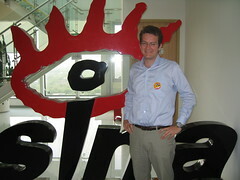 I’ve arranged to meet some Chinese geeks on Tuesday. I’ve been asked/forced to give a presentation about the webpy Web application anti-framework. Since I don’t have a computer and I have not written anything substantial with the library it’s going to be a little tricky. They also suggested I compare it to other Web application frameworks. I just hope there isn’t a sea of people there. Otherwise this will be very embarrassing.